We’ve made this Smoky Mountain Fall vacation guide so you can find out what’s going on in Pigeon Forge in October 2015. Here are 10 incredible October events and activities in Pigeon Forge, TN! Beautiful weather, changing fall foliage, and gorgeous mountain landscapes make the Smokies an incredible place to enjoy the season. Surely, one of the best ways to experience October in Pigeon Forge is to plan an outdoor adventure or two. Give a few of these a try when you’re in town! Corn Mazes – a delightfully fun fall activity for the whole family. See how much fun you’ll have getting lost in a maze by paying Kyker Farms a visit when you’re in the Smoky Mountains! There are few fall activities that can beat taking a hayride in beautiful Cades Cove. National park rangers guide these evening rides in the national park, so you’re bound to learn a lot about the Smokies! Tickets $14 per person and rides takes place every Tuesday at 4:30 to 6:30 in the fall season. As you can imagine, these hayrides are incredibly popular. Hayrides are first come, first served, so you’ll want to arrive early to experience this excellent event. Cades Cove Riding stables conducts other hayrides daily. Although these rides aren’t led by park rangers, but they do offer an incredible chance to see the beauty of fall in Cades Cove. October is a truly action-packed time to vacation in Pigeon Forge. You’ll find no shortage of great seasonal events that can make your trip truly special. The National Southern Gospel & Harvest Celebration – Oct 2 – Oct 31 – Dollywood knows exactly how to celebrate the beautiful fall season in the Smoky Mountains. You can enjoy live gospel music, Smoky Mountain crafts demonstrations, and beautiful fall decorations at Dollywood during this month long event. All shows are included with Dollywood’s admission price. Wears Valley Fall Fest – Oct. 16 – Oct. 18 – This family-friendly, free fall festival in beautiful Wears Valley features art displays, craft-making, live-music, entertainers, story-telling, and plenty of delicious southern food! Trick of Treat at the Pigeon Forge Community Center – Oct. 29th – The kids will love getting candy at this non-scary Halloween event! Local vendors bring interactive displays and handout candy to cheerful vampires, super heroes, and princesses. Halloween At the Island – Oct. 31st – From 5:30 – 9:30, families will love this free event with hayrides, ghost stories, a costume contest, loads of candy, and plenty of Halloween fun! Visiting historic sites in the Smoky Mountains is ideal for late in the fall season. Once the leaves start changing in lower elevations of the national park, the old homesteads and farms become even more beautiful. To see lots of old homes in one place, take a stroll around the Elkmont region of the park. This abandoned community with spooky old dwellings is the perfect inspiration for your next ghost story. Speaking of Ghost Stories, what’s October without a few bone-chilling thrills? Luckily, you won’t have to travel far to enjoy spooky experiences in the mountains. There are plenty of haunted houses and adventure attractions to explore in both Gatlinburg and Pigeon Forge. The newest scary attraction in Pigeon Forge is Outbreak, a Zombie Adventure located in the heart of Pigeon Forge at the Hollywood Wax Museum. Of course, you can find your own haunted places in the Smoky Mountains in this frightful time of year. Simply driving around the Smoky Mountains is an excellent way to spend a beautiful day in October. Be sure to check out a few of these choice routes on your trip! The Roaring Fork Motor Trail – See historic homes and waterfalls on this drive near Gatlinburg. The Clingman’s Dome Road – Mountain views from the tallest peak in the Smokies. The Cades Cove Loop – Historic homes and mountain views. This loop road can become crowded. Parson’s Branch Road – Old gravel road in the national park. The Foothills Parkway – A scenic route with incredible views of the mountains. The Dragon – A popular motorcycle route near Fontana Dam. The Gatlinburg By-Pass – A short scenic bypass with views of Gatlinburg. If you drive the Newfound Gap Road near Gatlinburg, you’ll pass by some of the best overlooks in the Smoky Mountains. 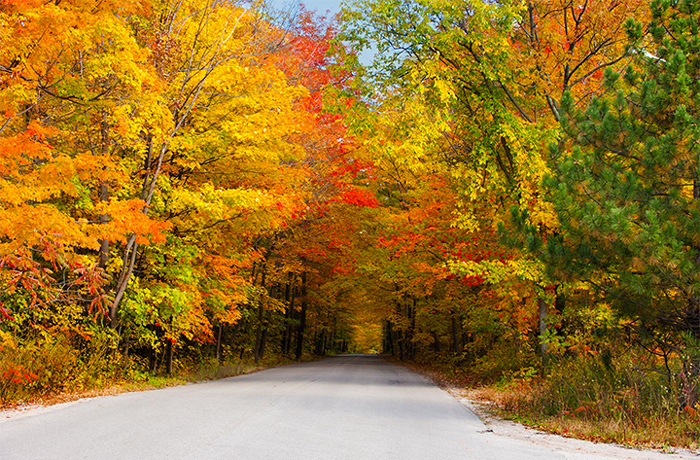 These overlooks allow you to see gorgeous fall colors for miles and miles. Campbell Overlook – Two miles past the Sugarlands Visitors Center, you’ll find Campbell overlook on the right side of the road. This pull-off offers an unbeatable view of Bullhead (the eastern face of Mount LeConte near Gatlinburg). Morton’s Overlook – By driving 13.5 miles on the Newfound Gap Rad from Sugarlands, you can see this pull off just before you reach the Newfound Gap parking area. This overlook offers views of the Tennessee mountains near Gatlinburg. Oconoluftee Valley Overlook – On the other side of Newfound Gap, this overlook of the North Carolina mountains is only a mile from the parking area. With so much to do and see in Pigeon Forge in October 2015, you’ll need the right lodging for a quality stay. With our convenient Pigeon Forge family-sized cabin rentals, you can stay close to all these action-packed events and activities in the Smoky Mountains!